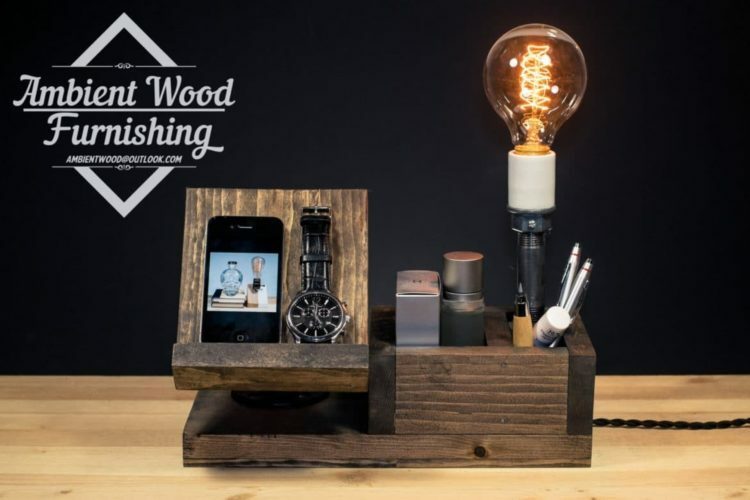 Look at these Wood Docking Station Lamps, 3 models, 3 gift ideas with happiness assurance! All wood products are hand shaped and crafted in-house. This gives the possibility to attend to the tiniest detail on material which can never be achieved by CNC* woodworking machines used often on the market for wood phone supports. As a result, each of our product is unique, organic, and a perfect showcase of our master craftsman’s skill. Apple Watch hole for a charger. The hole made for it is for ONLY the original regular charger we have the charger and we make sure it fits on each station! If you have the Apple charger sports model or any copy we can’t give the guarantee it will fit. A little utility station made of salvaged pine wood and sanded roughly to keep an industrial style we added a docking station mounted on an iron pipe stand.